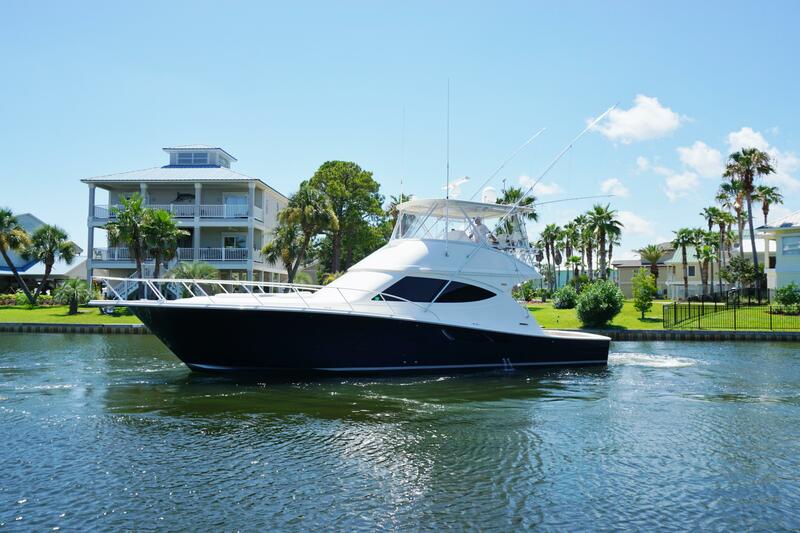 2011 Tiara 48 Convertible 4800 "DONNY D III"
The 2011 TIARA 48’ CONVERTIBLE SPORTFISH DONNY D III is powered by a pair of 1015 hpCaterpillar C18-Acerts and features a three-stateroom, two-head, galley-up layout. 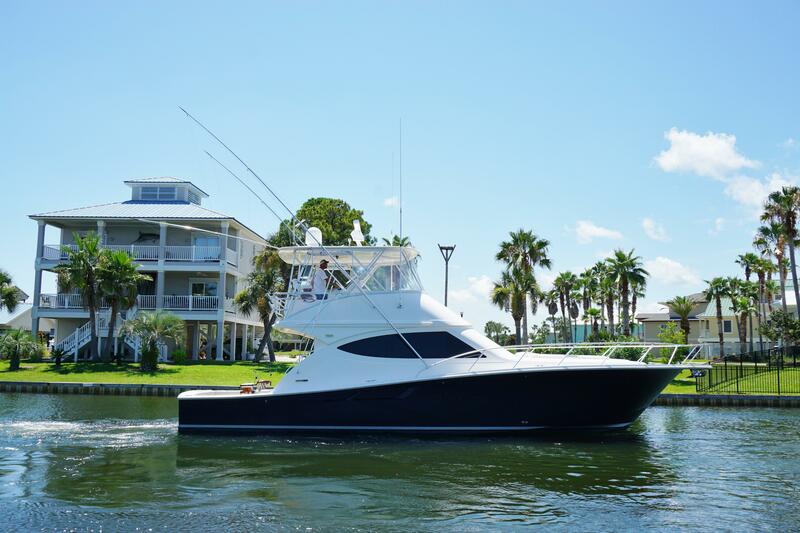 She is riggedto fish with Rupp outriggers, Release chair with rocket launcher, teak cockpit, livewell, tackle center, freezer, transom door, and cockpit mezzanine seating. 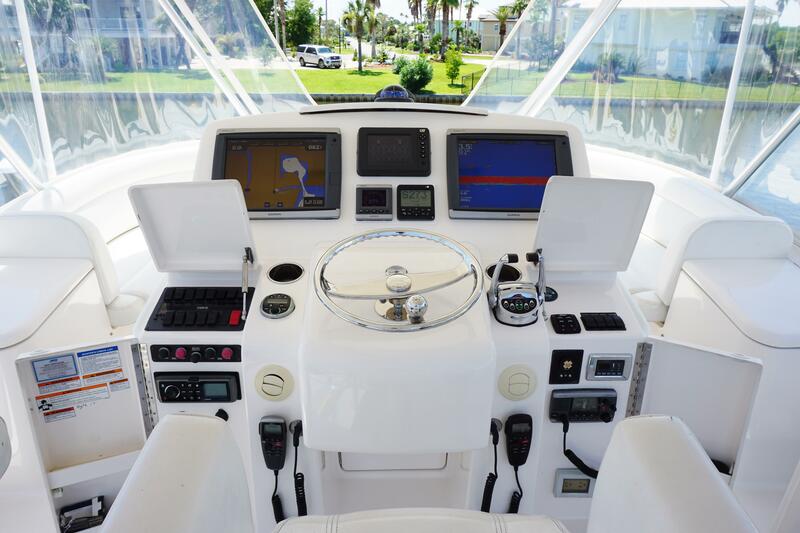 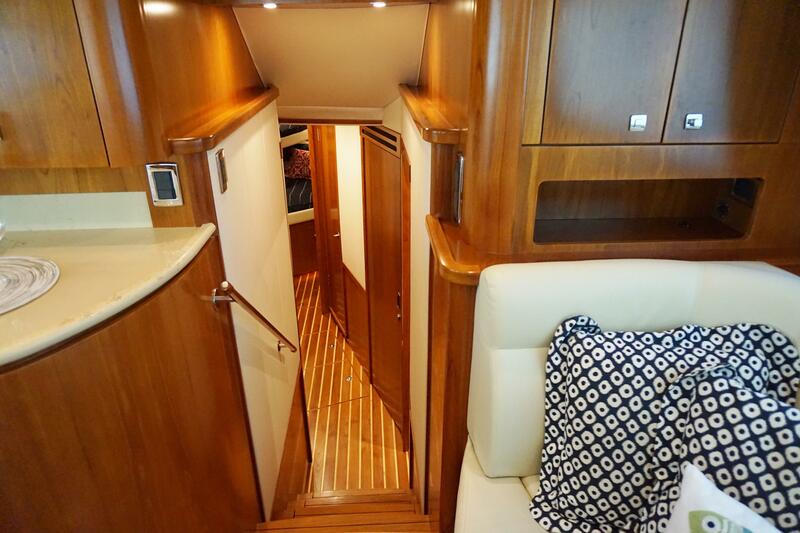 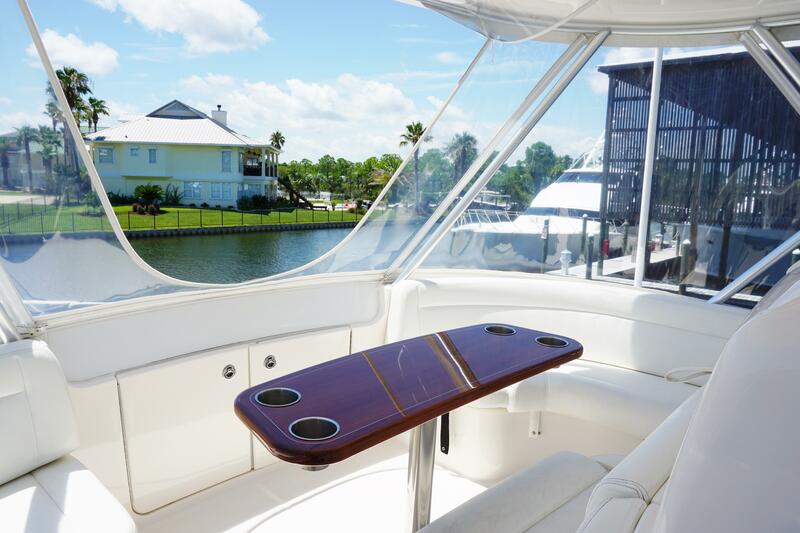 This TIARA 48’ is equipped with the optional fiberglass molded in staircase to the flybridge. 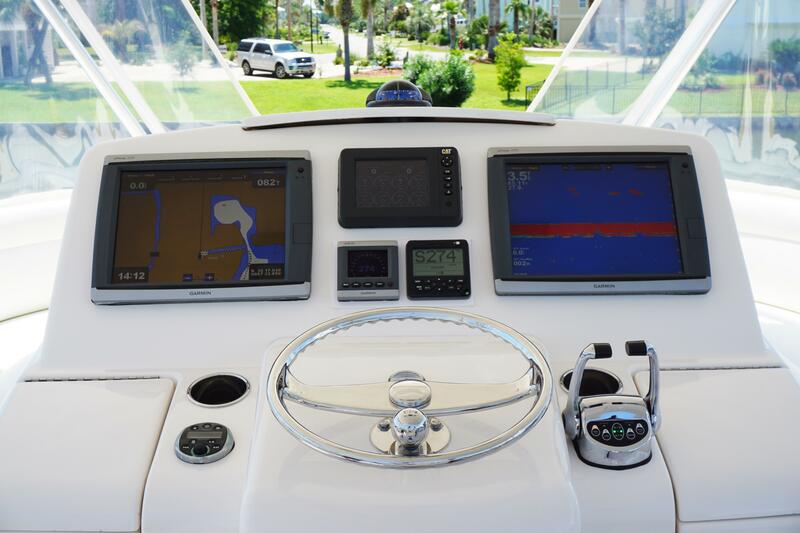 DONNY D III has a full complement of Garmin electronics. 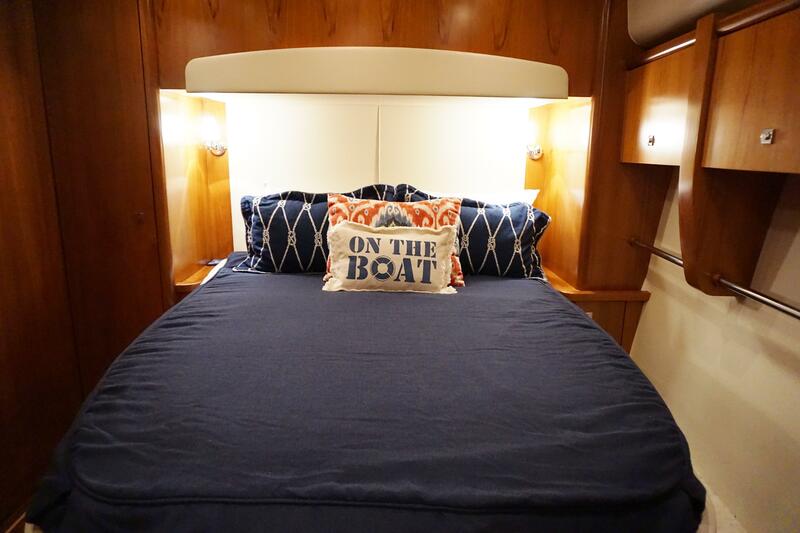 Her hull was painted "Flag Blue" by Saunders Yacht Works and she is kept in a covered slip for eight months a year. 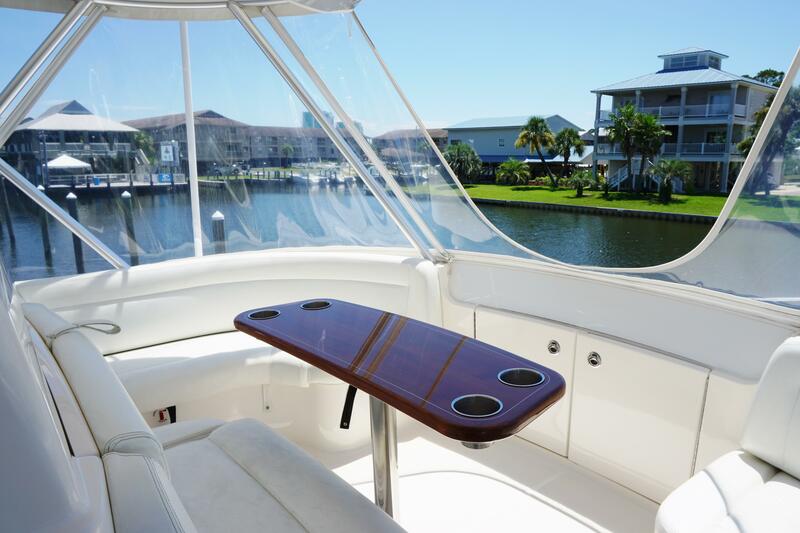 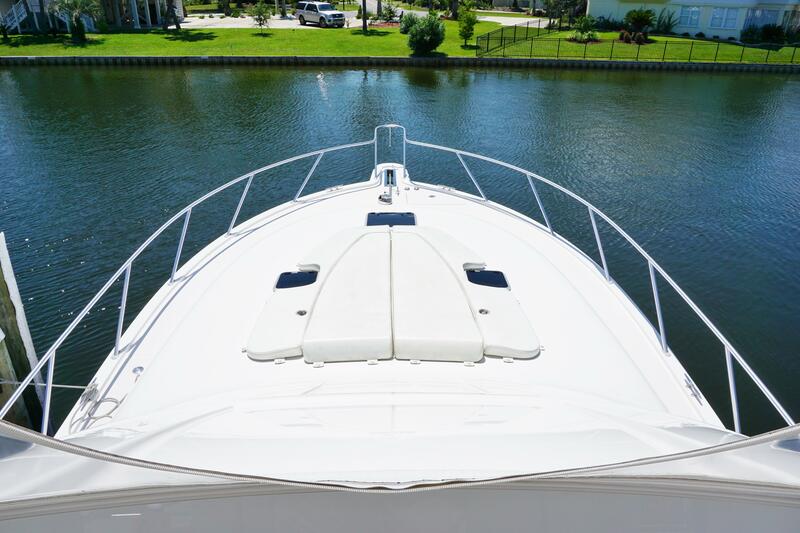 This 48’ CONVERTIBLE has a full-time captain and is in impeccable condition! 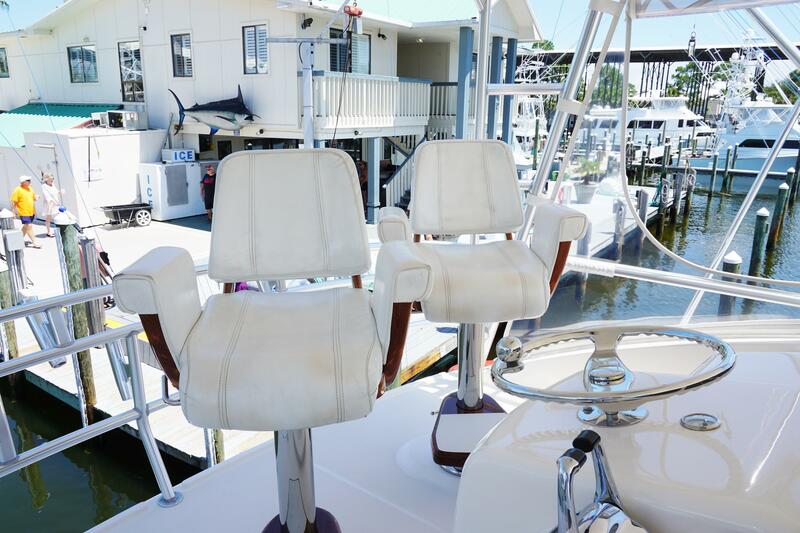 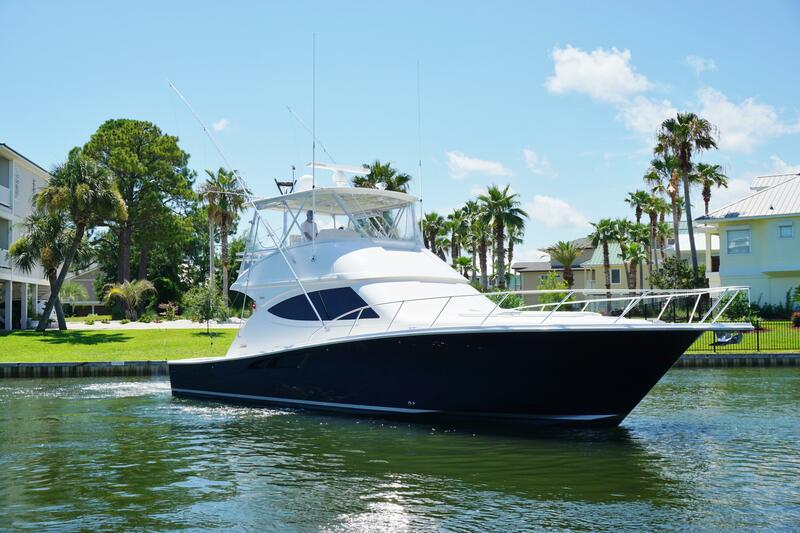 If you’re in the market for a 48’ SPORTFISH, contact us today toarrange an immediate viewing of the 2011 TIARA 48’ CONVERTIBLE SPORTFISH DONNY D III. 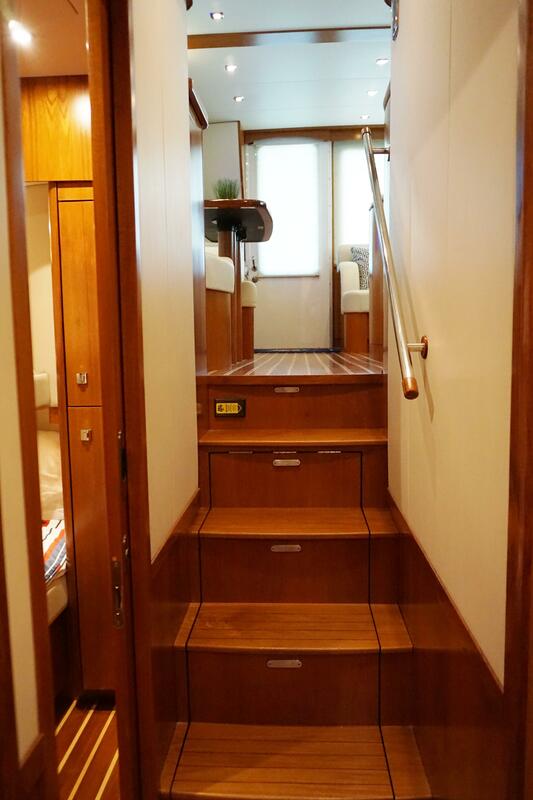 Entering the salon through the sliding door to starboard there is a large L-shaped ultra leather sofa (with pull-out sleeper) to port. 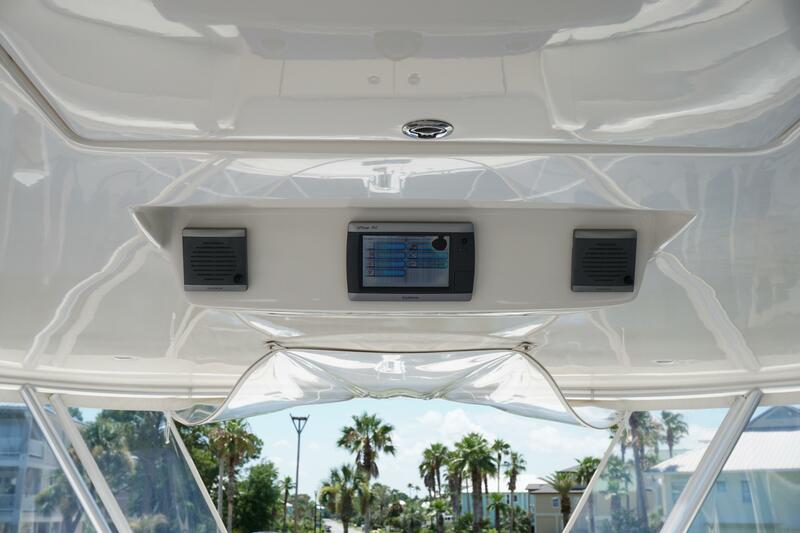 To starboard is the entertainment center with 37” pop-up TV and Bose audio system. 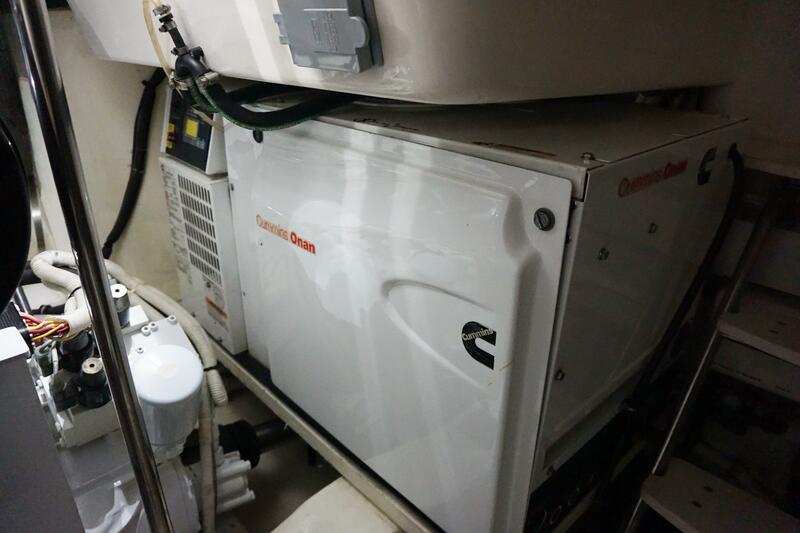 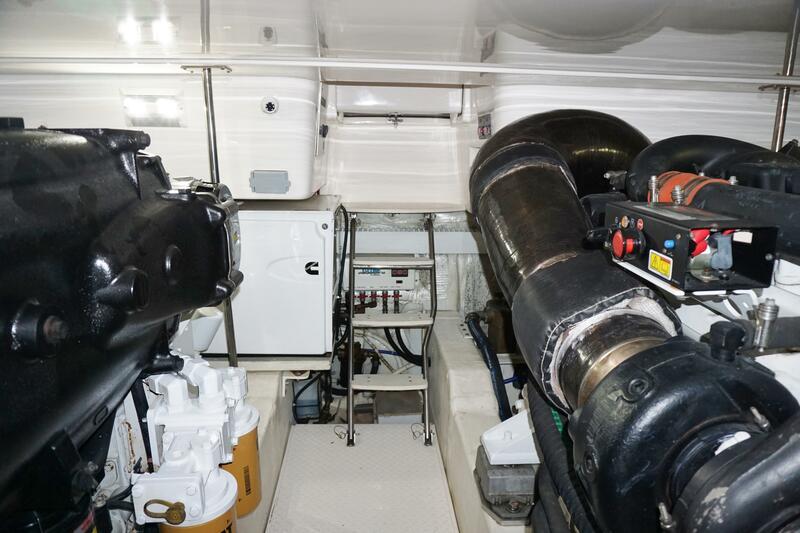 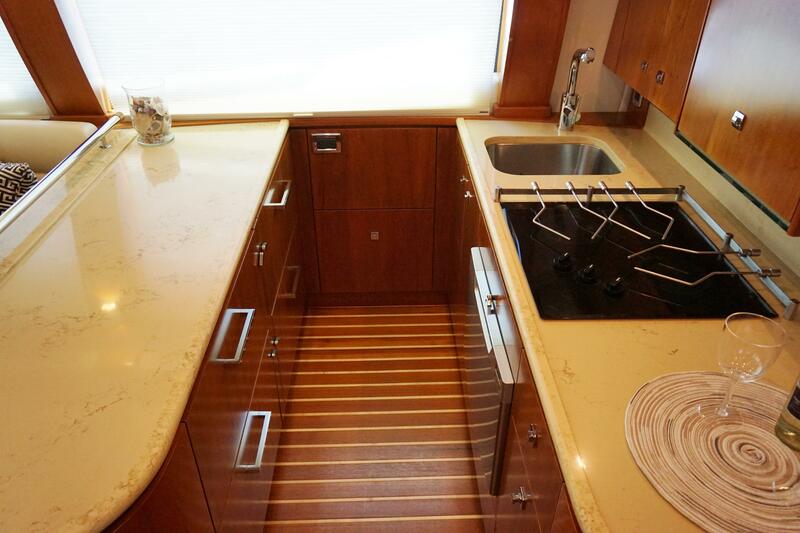 Forward to port is the U-shaped galley with quartz counters, Sub-Zero refrigeration, microwave oven, stove, dishwasher and loads of cabinet space. 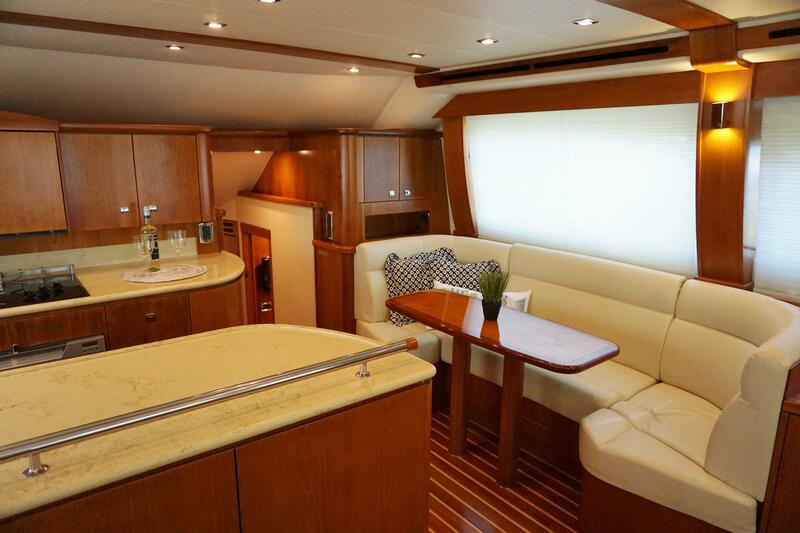 Opposite the galley to starboard is the U-shaped dinette with Ultraleather seating and teak table. 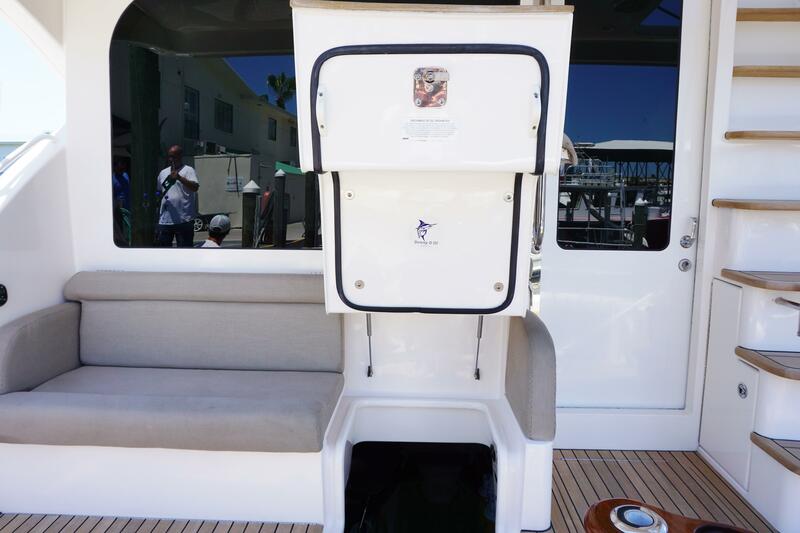 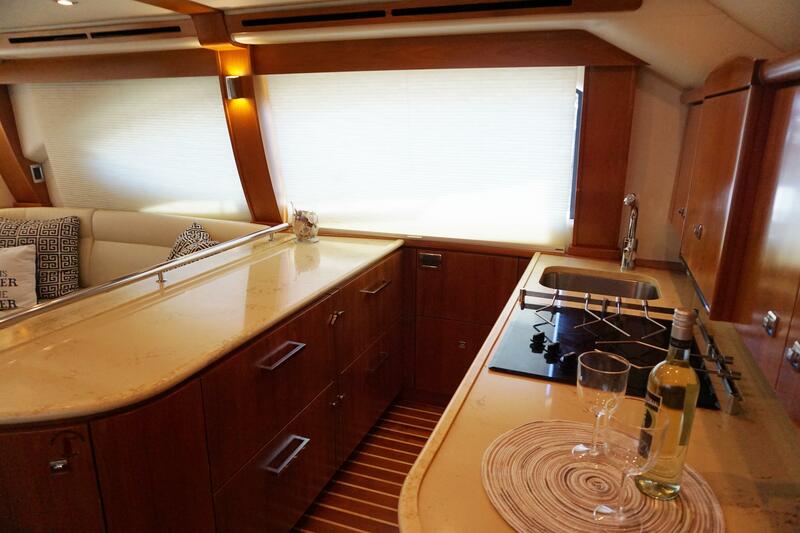 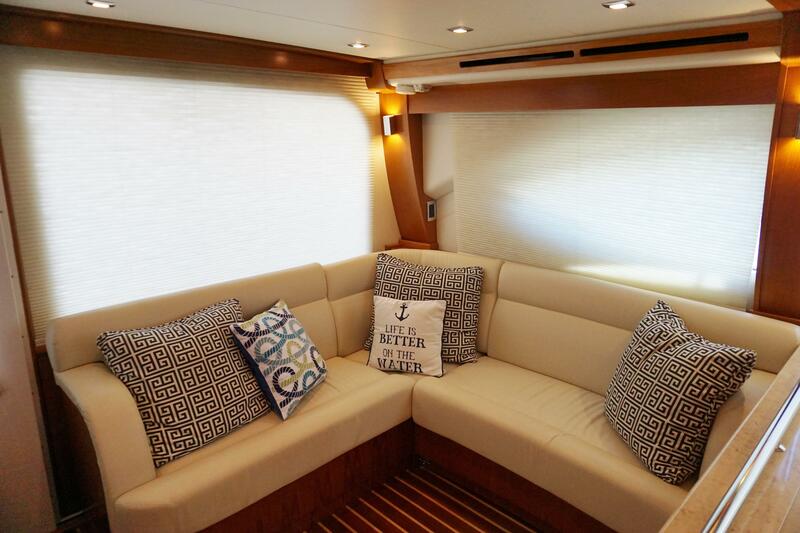 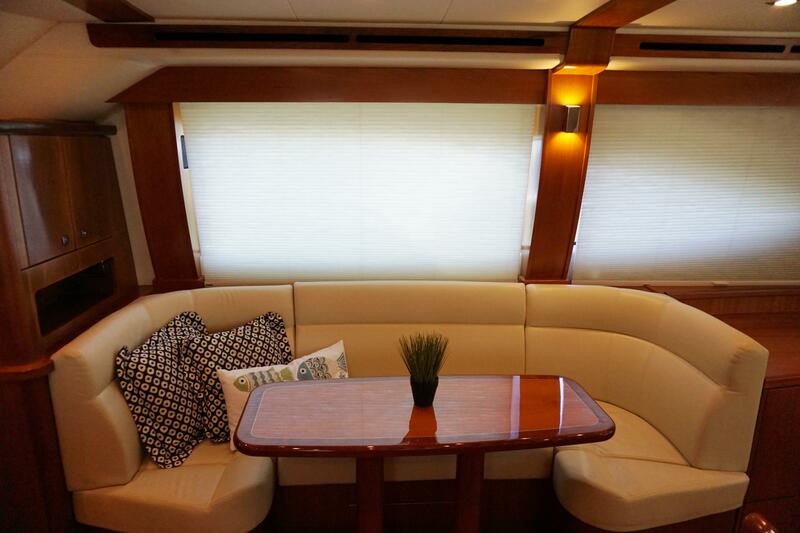 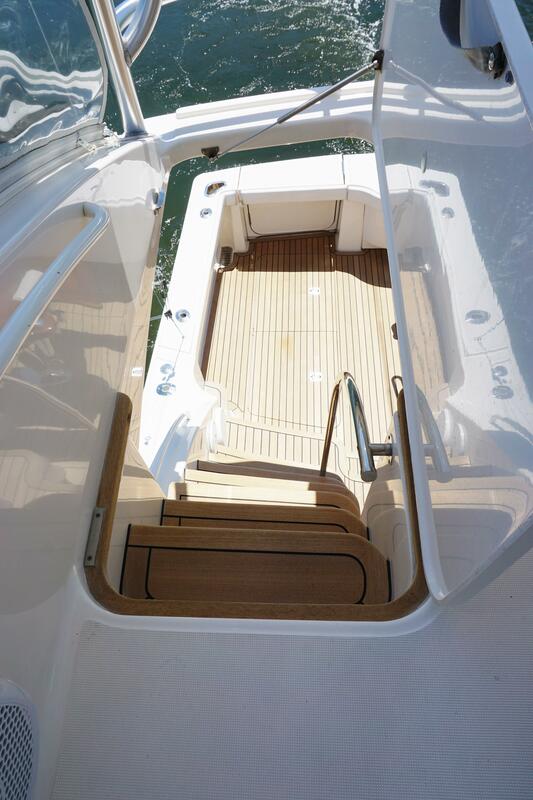 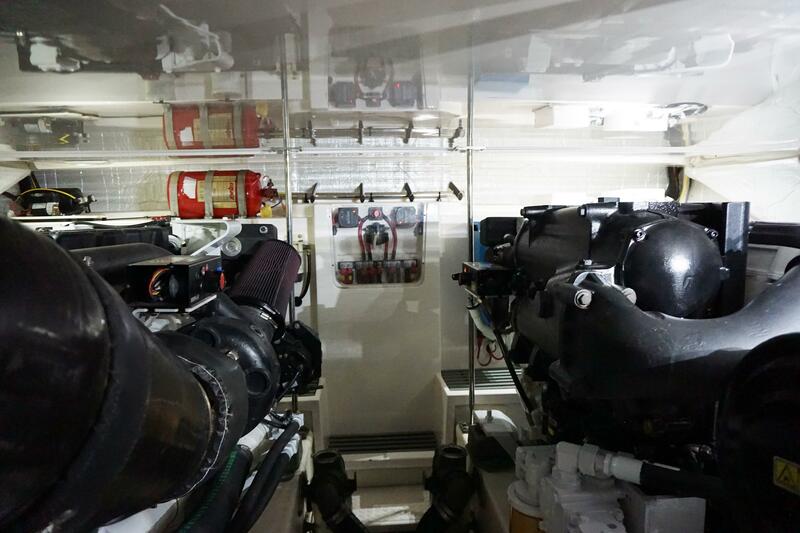 The floors throughout the boat are teak and holly and the salon windows feature roll-up blinds. 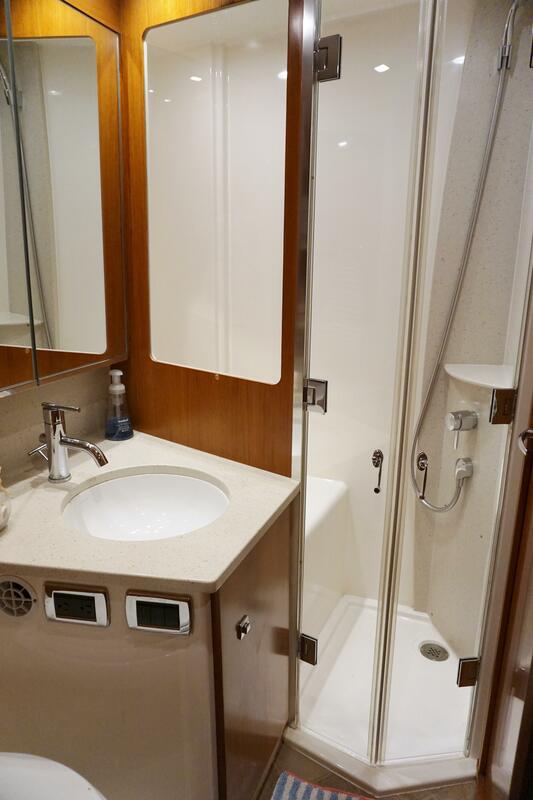 Moving forward and down to the cabin area, the Master Stateroom is to port. 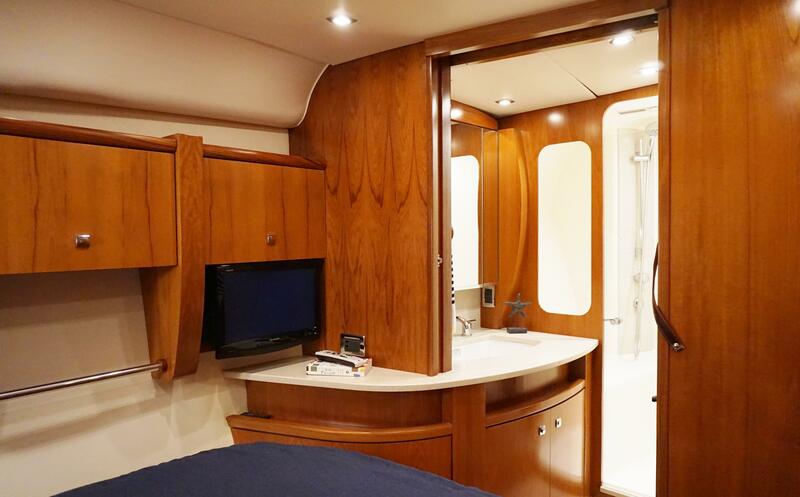 It features a queen bed with night stands, hull side cabinets, hanging locker, 19” LCD TV and a private ensuite head. 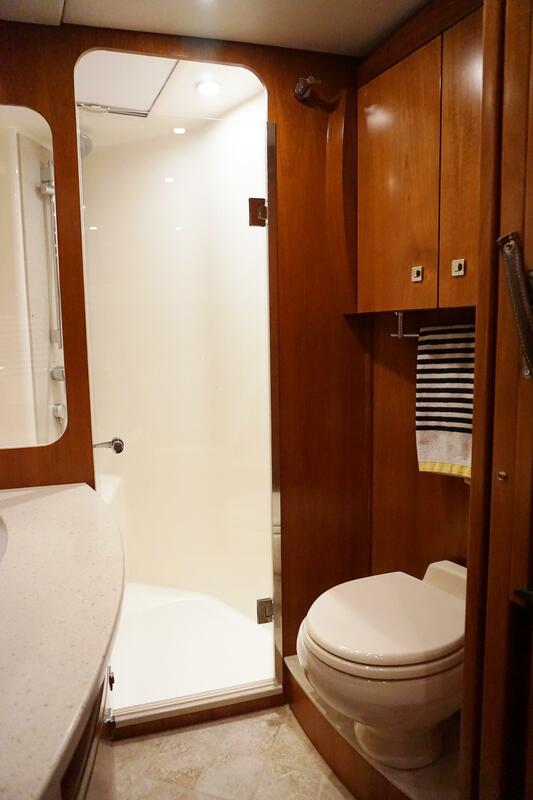 The master head has Corian counters, porcelain sink, vanity and mirror, linen closet, Vac-U-Flush toilet, tile floors and an enclosed shower with seat. 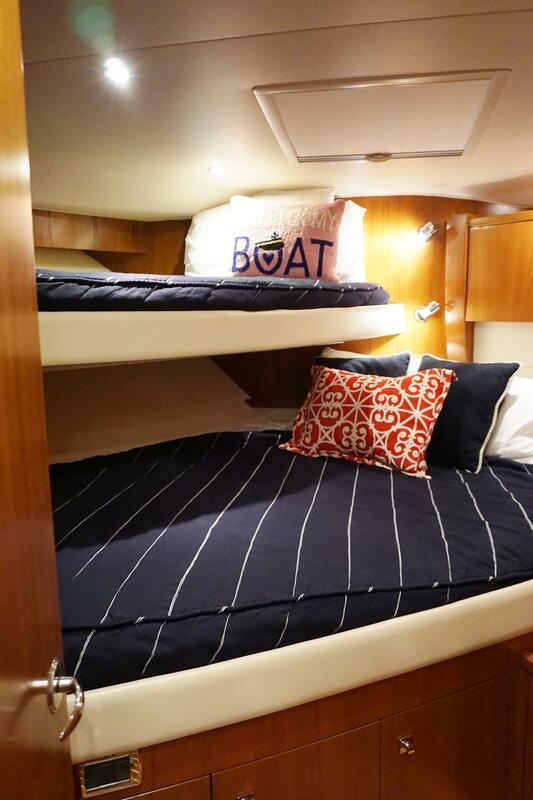 The forward guest stateroom has a double lower berth and single upper berth to port. 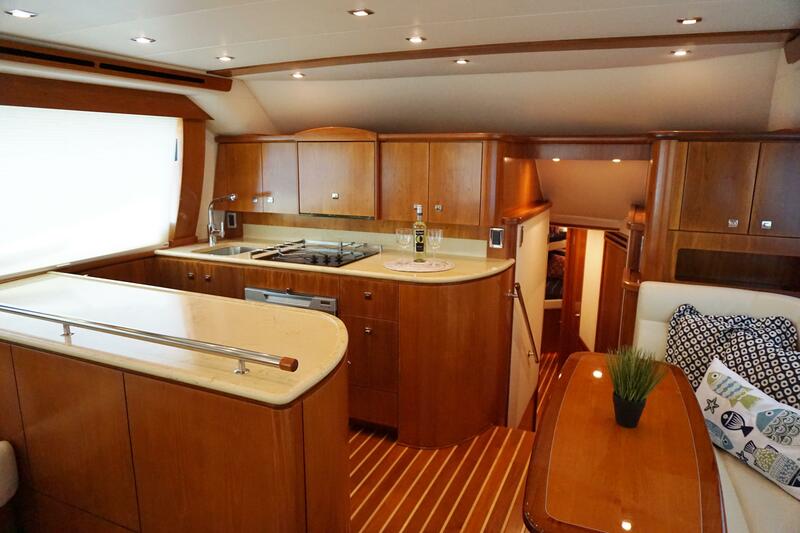 There is also a hanging locker, drawer storage and 19” LCD TV. 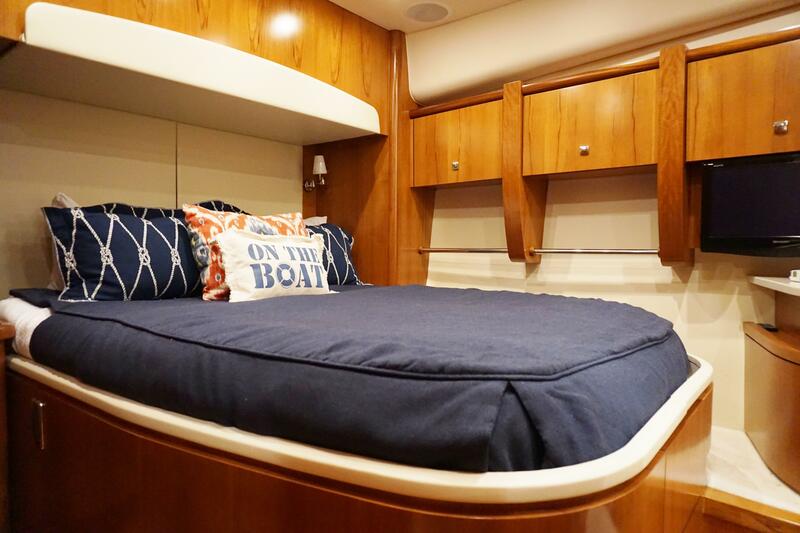 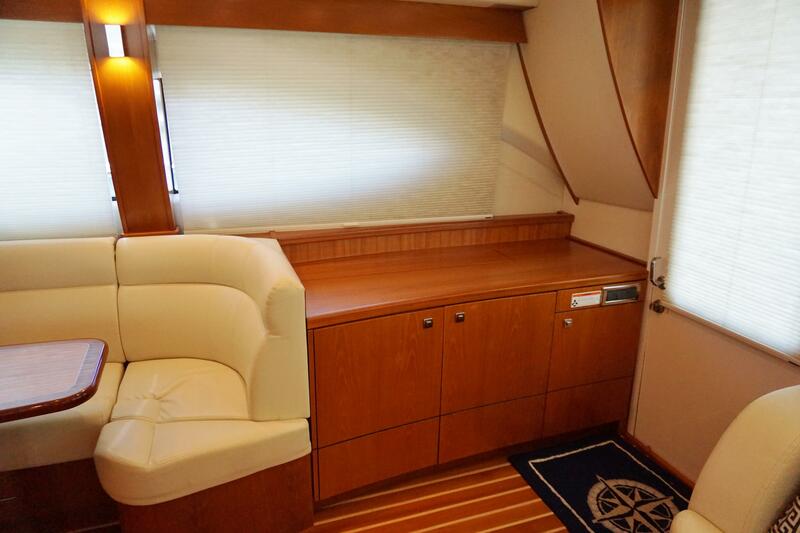 The second guest stateroom is aft and to starboard and features over/under berths, hanging locker and a 19” LCD TV. 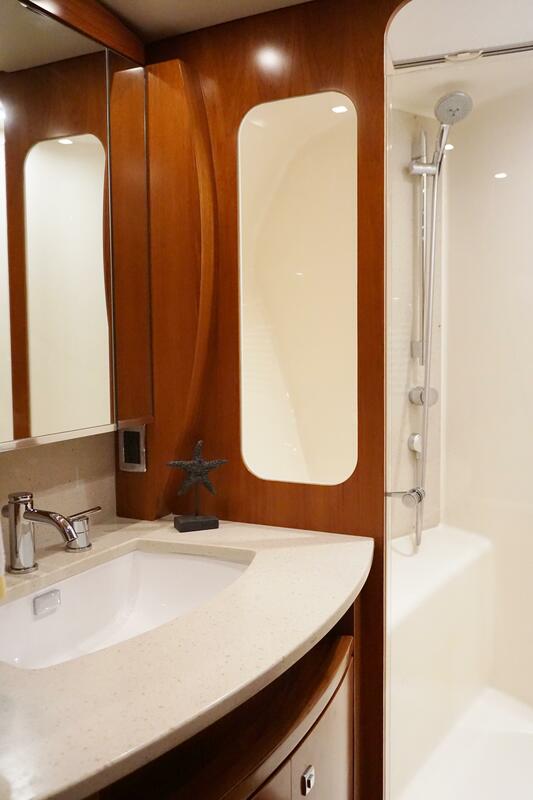 The guest/day head is to starboard with Corian counters, porcelain sink, vanity with mirror, tile floor, Vac-U-flush toilet and an enclosed shower with seat. 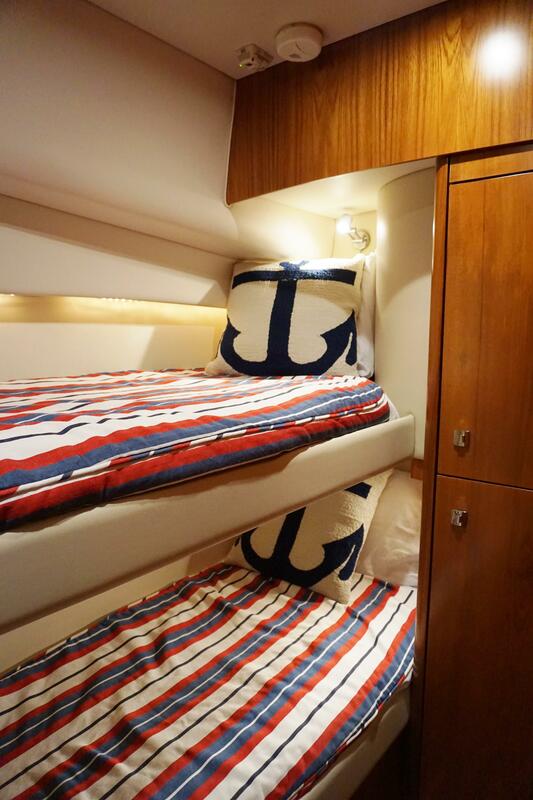 This head is accessed from the hallway as well as the forward stateroom.